In 1976, Bob began repairing and painting cars in the garage of his home. He started with the cars of friends and only charged for materials. Word got out about the quality of his work, and he was able to start charging for his services. In July 1983, Fender Menders was born. At that time, Broomfield was a sleepy bedroom community – and Villager Square shopping center was a big weed patch! Neither the Safeway nor the Burger King center existed and 3.Margaritas was an empty lot. Main Street (then called Pierce) was a bumpy, two-lane gravel road. Our building was ratty and decrepit. The parking lot was dirt. The fanciest thing in the whole place was the sign and it wasn’t great. Being young and foolish, we didn’t see these things as a problem. Our customers knew our quality would not be affected. Bob worked day and night – sometimes crawling in the back seat of the car being worked on and sleeping till morning, only to start again. Ava kept the home fires burning. She worked full time and, when she got home, cooked and delivered dinner so that Bob could keep working. In 1985, our son Scott started working after school. Today, Scott is the shop manager and “Doer of All Things” when Bob and Ava are out for vacation or a long weekend. He is a huge asset to Fender Menders; without him, the business could not endure. Our team consists of Bob (the bedrock of the business), Ava (payroll/bookkeeper), Scott (shop manager), Joe Velez (paint tech since 1994), and Ron Scripter (body tech & frame specialist since 2007). Using our state-of-the-art dropdown paint booth and computerized measuring and frame-straightening equipment, skilled technicians turn out outstanding repairs and improvements. Fender Menders works with all insurance companies and walks customers through the process of insurance claims so that they can get necessary repairs done as quickly as possible. Our goal has not changed since 1983 and we strive daily to provide quality repairs as quickly and economically as possible. 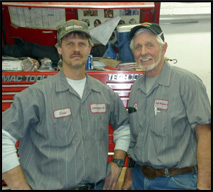 Fender Menders is a down-to-earth, friendly, hard-working, family owned and operated business. The Nelson family looks forward to continuing to serve the Front Range community for many years to come. Copyright © 2010 Fender Menders Inc.